AutoCAD 2009 news that are also relevant for Autodesk Architectural 2009. The DWG file format is the same as in ACA 2007 and ACA 2008 but there are still differences because of the ACA custom objects that make the files saved with ACA 2009 not fully backward compatible. 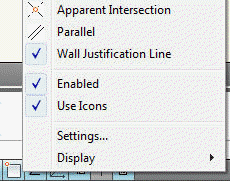 New snap setting for Wall Justification Line and it's on by default. On the Properties palette and Design tab in the Advanced category there is Bound spaces property that can either be Yes or No. This gives more control over the space bounding behaviour. InfoCenter has a link to the RSS feed for the AutoCAD 2008 discussion group. Do not attempt to install the product by double clicking on the application's MSI file, as the software will not be installed properly. Instead, use the Setup executable. "Offline Files: Unable to make '2009 AEC-Keynotes-Assemblies (Imperial).mdb' available offline on <\\servername\home\username\autodesk\my projects\sample project\>. Files of this type cannot be made available offline." This occurs because the Sample Project in My Documents contains a Microsoft Access database. The warning can be safely ignored. If the product is installed with Shared Configurable Folders on a machine running Vista that is bound to a different domain than the Shared location, the uninstall may halt when it tries to establish access to them. This error can be resolved by disabling the User Account Control. Please refer to Microsoft Help for directions on making this change. After performing a reinstall on an existing installation of AutoCAD Architecture 2009, the Express Tools pulldown menu may not be visible. The menu file itself should still be loaded, in which case the command Expressmenu will restore the pulldown menu. Turn off the InfoCenter balloon for Workspaces to reduce the time to launch AutoCAD Architecture. 1. Type CUI at the command line. 2. In the CUI dialog under "Customizations in All CUI Files," select Rollover Tooltips. 3. In the Object Type List, select "Detail Components." 5. Apply and OK out of the CUI dialog. 6. Select to remove the object from the Object Type List in the task dialog when it is presented. Rollover tooltips will still be available for Detail Components but they will only report AutoCAD entity information (e.g., Block Reference, Polyline, and Hatch.) To re-enable the Detail Component specific data, reverse the steps, edit the Object Type List, include Detail Components, and check the three properties listed. Dragging and dropping a package from Content Browser to the Tool Palette will result in a lengthly delay when AutoCAD Architecture is installed on Windows Vista. This delay only occurs the first time the action is performed during a session. NOTE: To ensure proper scaling, set the current annotation scale to 1:1 prior to updating legacy annotative content. AutoCAD Architecture 2009 has MsLtScale set to 1 by default. When opening a drawing that uses this value in a previous release, the LtScale will need to be manually set to maintain linetype scale visual fidelity. Aec Dimensions in AutoCAD Architecture 2009 use a DimScale value of 96 by default. If opened in a previous release and viewed at a scale other than 1/8" = 1’-0" the DimScale will need to be changed to the appropriate scale. Multi-View Blocks do not respect the block setting "Match block orientation to layout." If a Multi-View Block with more than one Annotation Scale Representation is opened in a previous release and is moved, all of its Annotation Scale Representations will be moved when the drawing is reopened in AutoCAD Architecture 2009. Adding a height value to the text style changes the height of text within AEC Dimensions but not AutoCAD dimensions. It is not possible to summon the Dimension Style Manager dialog via the Display Properties dialog if the Display Properties dialog was accessed using the Display tab of the Properties Palette. Instead, to access the Dimension Style manager, select Dimension Style from the Format pulldown menu. Using the Apply Component Override or Modify Component Override grip(s) while editing component dimension points within walls may add a new component dimension point instead of moving the existing component dimension point. If this occurs, remove the unwanted component dimension point by clicking the associated Remove Extension Line grip. AutoCAD Architecture 2009 installed on 64-bit Windows XP may crash while loading a project if the project bulletin board contains the <v:shapetype ..> node. To avoid this, edit the file and use the standard HTML image tag <img ..> instead. When post linking views to sheets wait a few seconds before moving the mouse from the drawing editor to project navigator. Otherwise the post link may not complete. Make sure the ViewCube and SteeringWheel UI elements do not overlap, or the application may crash when the SteeringWheel control is clicked. AutoCAD Architecture 2009 may crash after selecting a visual style or a named view from 3D orbit with the ribbon open. To avoid this, close the ribbon or exit 3D orbit mode first. The application may crash if the mouse wheel is used to pan shortly after the SteeringWheel control is used to enter orbit mode. To reduce the likelihood of this happening, pan before entering orbit mode, or pan more slowly. The graphics for previewing a generated space may occasionally be incorrect for highly complex geometries. However, the space will still be generated correctly. If AutoCAD Architecture 2009 is installed on a PC running 64-bit Windows Vista with an Nvidia graphics card, the style manager's embedded viewer may not update correctly after the style manager dialog is resized. However the viewer will be sized correctly after the style manager is dismissed and relaunched. Do not use the filter button in the design rules tab for display theme styles when AutoCAD Architecture is installed on 64-bit Windows Vista, or the tab will be visually corrupted. This limitation is not present if the DisplayThemeStyleEdit command is used instead. Use the DWF format when publishing AEC object Property Data Sets to password protected files; if DWFx is used, it will not be possible to select AEC objects in Autodesk Design Review. If password protection is not employed either the DWF or DWFx may be used. The Publish command available in the File menu (and at the commandline) will publish Sample Project sheets in color. To get the correct black and white output, use the Project Navigator's Publish to DWF, Publish to DWFx, or Publish to Plotter command instead. This behavior is not present in other projects. Spaces created with the Space Generate tool will be associative, whether or not the Associative property is set to No in the tool. The space can be set as non-associative after its creation via the properties palette. The net, usable and gross boundaries will be generated as one segment, offset to the base boundary of the curtain wall. In order to produce the correct offset results, the boundaries may need to be manually offset to the preferred location. The boundaries for net, usable and gross area may not be offset correctly for curtain walls which reference a base curve. When spaces are generated using a calculation standard, the boundaries for usable and gross area may not be offset correctly for walls with sweeps. To resolve this, use the manual offset boundary type and manually edit the boundaries to the correct location. SIS Standard: The usable offset boundary may fail to offset correctly when a column or mass element is located in the corner of a wall connection. To work around this issue, use the manual offset boundary type and manually edit the boundaries to the correct location. When drawings from previous versions are opened, spaces may disappear or display a solution tip after the 'Automatically update associative spaces' setting is enabled in the Options dialog. This may happen for spaces that have been generated from collinear surfaces. To fix this first select all the associative spaces in the drawing and update them using the command ‘Update Space Geometry,’ which is available on the right-click context menu. Then enable the 'Automatically update associative spaces' setting in the Options dialog. Wall cleanups may temporarily fail after an xref is unloaded and reloaded, if the xref contains walls that cleanup with the host drawing and/or other xrefs. This can usually be fixed by invoking ObjRelUpdate. If this does not work, closing and reopening the drawing will always correct the cleanup. A cleanup error can occur when a short wall segment lies within the cleanup radius of another wall. After reducing the cleanup radius, run "ObjRelUpdate" to see updated cleanup results. Wall endcap linework may become visible when walls on different elevations cleanup at a corner. Disabling the wall's Below Cut Plane (or in some cases, the Above Cut Plane) display component visibility will remove these artifacts. Using the options dialog to switch profiles may cause unwanted UI changes such as the elimination of the Quick Access Toolbar. If this becomes a common issue, switch profiles by exiting the application and restarting it with the appropriate command or shortcut instead. The UI can be restored to its proper state by invoking the CUI command and setting one of the workspaces current. Using the options dialog to switch to a different profile may cause toolbars and pulldown menus to load incorrectly if the profile was not previously used. To avoid this, launch each desktop shortcut once immediately following installation. The Quick Access Toolbar may fail to load correctly if AutoCAD Architecture 2009 is configured to use network licensing and the network is temporarily unavailable during application startup (forcing a second launch attempt.) The UI can be restored to its proper state by invoking the CUI command and setting one of the workspaces current. Do not attempt to reset a profile that is set current, or the profile may become corrupted causing the application to behave unexpectedly. To restore the profile to a usable state, set another profile current and reset the first profile again. Enter the command RIBBON to invoke the ribbon. Enter the command CUI to invoke the customize user interface dialog. OK to accept changes in the CUI dialog. At this point, the Action Recorder should be present in the ribbon. Export drawings to AutoCAD before attempting to invoke and use the ExportLayout command. Performing Export to gbXML from within a Construct may cause error messages to display when the XML file is imported to Green Building Studio. To prevent error messages from displaying, open the Construct as a drawing outside of Project Navigator before running Export to gbXML. Tapered Interior walls for Non-Associative adjacent spaces export to gbxml as Exterior walls. To prevent this from happening, create the Spaces so that the sides of the adjacent spaces are parallel to each other. Export to gbXML does not support openings on curved non-associative freeform spaces. IFC Export will only export only the components of objects that are On in the Model Display Set. IFC Export does not use the current display when exporting the file. To verify the visibility of an object, open the Display Manager and browse Sets and Representations by Object. Both wall and slab objects that have overlapping components will be exported without their named components. The components are combined into one called "Unnamed." The overall wall or slab geometry is maintained to the shrinkwrap or outline extents only. Cells in a Sheet Keynote Legend containing sheet keynote blocks may become invalid after using the Block Editor or the Block command to change to one of the block definitions. To correct this problem, save and reopen the drawing. Care must be exercised when updating keynote legends that exist in previous version drawings. If the keynote database that was used to create the Legend is not present when the legend is updated, all data in the legend will change to pound symbols (#). To repair this, load the previous version database in the Aec Content tab of the Options dialog, and then update the legend again. The keynotes will be restored. The Imperial profile must be installed. If you haven't installed Imperial, you can add it by doing a Reinstall > Add/Remove. The profile can be removed once the tools have been accessed. Run ACA from the Metric profile. Open the Sample Tool Palette and navigate to the Document group > Annotation tab. Open the Content Browser and navigate to the Documentation Tool Catalog - Imperial > Keynotes. Drag the Reference Keynote and the Reference Keynote (Straight Leader) tools to the tool palette. Open the properties for each of these tools, set the Multileader style location to use the Leader Symbols(Metric).dwg (browse to the Metric Styles drawings in your content). Open the Leader Symbols(Metric).dwg and switch to Model Space. Use each of the new tools to verify that -AecDtlAnnoMultileaderAdd is called at the command line. Place any Keynote in the drawing, save and close. Now the Imperial profile may be removed, if you wish. You may want to place these new tools in the Content Browser > Documentation Tool Catalog - Metric > Keynotes for future access. Note that Layer State functionality replaced Architectural Desktop Layer Snapshots in AutoCAD Architecture 2008.
and create a new DWORD named BypassSnapshotConversion with value 1. Note: Always back up the registry before making any changes to it. It is not possible to create a viewport override for the lineweight of a block set to ByLayer whose components are set to ByBlock. Entities in xrefs that have components which use ByLayer linetypes may not display overridden linetypes per viewport. On multi-monitor systems using Hardware Acceleration and different display settings, dialogs that include the Object Viewer should be kept on the primary display. This is to guard against various system errors that may otherwise occur. Do not use refedit to edit blocks containing property set overrides. Instead, use the block editor. When attempting use CTRL-select to zoom to an object in a schedule table, the Selection Preview Cycling panel may display instead. Selecting "Don't show me this again" restores the Zoom to functionality. Object IDs will not display correctly in schedule tables on 64-bit operating systems, and for similar reasons drawing compare will not report differences in property set data on 64-bit systems. If this functionality is required, install the application on a 32-bit operating system instead. Compared to previous releases, AutoCAD Architecture 2009 uses greater precison when performing internal calculations. Thus there may be minor differences in reported values compared to earlier versions. This is as designed, and data reported in the current version is more accurate. A problem with calculating slab perimeters was fixed in AutoCAD Architecture 2009. As a result the values of certain automatic properties may change. The new results are correct. To be able to reference edit drawings saved from AutoCAD Architecture 2009 in Autodesk Architectural Desktop 2007, the variable LayerEval needs to be set to 0 in AutoCAD Architecture 2009. This is a per drawing setting. It is not possible to use AutoCAD Architecture 2008 to refedit drawings containing space objects created in AutoCAD Architecture 2009. Openings on non-associative curved freeform spaces created in AutoCAD Architecture 2009 will not be displayed in AutoCAD Architecture 2008. Openings added outside a surface area in AutoCAD Architecture 2008 will have different locations when opened in AutoCAD Architecture 2009. Structural members now support two new properties: volume and true length. Values for these properties will be displayed as ?? in AutoCAD Architecture 2008 and 2007. As of AutoCAD Architecture 2008 the US detail component and keynote databases use the CSI MasterFormat 2004 standard. Using the Detail Component/Keynote Database Migration utility to migrate your database customizations from a database that uses the CSI MasterFormat 95 standard (as in Architectural Desktop 2007 and previous releases) is not supported. The migration utility will not properly migrate custom records from the older databases and may errantly overwrite records in the new databases with CSI MasterFormat 95 data. The Detail Component/Keynote Database Migration utility can still be used to migrate records from one CSI MasterFormat 95 database to another. Note also that using the Database Migration utility to update an older database with data from the new CSI Masterformat 2004 database is not supported. If you want to use a database from Architectural Desktop 2007 or previous releases with the current release of AutoCAD Architecture 2009, you can load it as described under Adding a Detail Component Database to Available Databases or Adding a Keynote Database in the Help. Note that the older database must be located with its corresponding content, maintaining the folder structure, to function properly. A details database will not function with the new 2009 US details content. Likewise, the previous version keynote database will not function to automatically keynote 2009 US details content, but only detail components inserted using previous version details or details in previous version drawings. For best results, it is recommended that drawings in a previous to 2007 format be opened and saved in the 2007 format before attempting to combine them, through Block Insert or Xref, with 2007 format drawings. Previous version drawings that include slabs or roof slabs with boolean additions will need to have the appropriate shrink wrap component turned on in order to display the full volume of the object. Slabs that contain boolean operations will be converted to interference conditions with additive interferences being applied to the slab's shrink wrap body display component. By default, slab and roof slabs in AutoCAD Architecture 2009 have the model shrink wrap body display component turned off, so this option will need to be turned on in order to see additive interferences from legacy slabs. When previous version drawings are opened, a dialog will be displayed with a warning that saving the drawing will upgrade AEC objects to 2007 format. If a previous version drawing is opened by double-clicking the file in Windows Explorer this dialog may be hidden behind the drawing, making AutoCAD Architecture 2009 appear to have hung; clicking anywhere on the application to give it focus will make the dialog come to the foreground. Project Standards in AutoCAD Architecture 2009 will not operate when either the standards drawings or project drawings have not been promoted to the 2007 format. When a project is promoted from a previous version to the current drawing and project format, Projects Standards automatically assigns new versions to many objects. Consequently it will be necessary to synchronize the project again. Prior to this action, the standards drawings should be opened, and new version comment should be added through either Style Manager or Display Manager. If an entire project remains unpromoted, the analyzing project drawings dialog will appear blank with an empty progress meter. This condition will clear once the entire project has been processed. The promotion of previous version drawings to 2007 format can be automated through the use of the following process, which starts with the creation of a batch (bat) file. Running the batch file makes a complete copy of the project (or folder that contains previous version drawings), then recursively searches for all dwg, dwt and dws files contained in this location and finally generates a script (scr) file. Running the script file results in each of the copied dwg and dwt files being opened, saved and closed, which results in these files being promoted to 2007 format. If any dws files are contained in the designated folder, their paths are displayed. These files will need to be manually opened and saved in 2007 format. For all details see the readme file. CUI migration is supported starting with Autodesk Architectural Desktop 2007 and Autodesk Building Systems 2007. CUI migration from customized menu folder locations is not fully supported. MNU and CUI migration from earlier releases (MNU - 2004, 2005 and CUI - 2006) can be accomplished from the CUI editor's transfer feature. Set the migrated workspace as the current workspace by selecting it from the drop-down list on the Workspaces toolbar. Enter MENUBAR at the command line and set the value to 1. The menus should now be displayed. Select [Save Current As...] from the drop-down list on the Workspaces toolbar. Select [Save], then [Replace] when asked to confirm the replacement of the existing workspace. The Import/Export migration feature found in AutoCAD 2009 is not supported in AutoCAD Architecture/MEP 2009. References to support files/folders within a CUI file will be migrated to the current product’s CUI, but the files/folders that they reference must be accessible. An example of this might be a menu item that refers to a slide library. Please ensure that the .slb file exists and that the folder where it resides is included in the support paths. The support paths can be verified by running the Options command, selecting the Files tab, then the "+" next to "Support File Search Path." To maintain the expected customer experience in AutoCAD Architecture/MEP 2009, certain parameters in the Options dialog will not be migrated. Closes all drawings in the current project that are open in the application. Specifies if the "Automatically update associative spaces" property is enabled or disabled in the drawing. Sets the Area Calculation Standard for the drawing. This property is used when generating spaces with the offset boundary set to "By Standard." Displays the bound spaces property for AutoCAD entities on the Properties palette. Sets the value for the maximum automatic adjacency in the drawing. Sets the value for the maximum gap size when generating spaces in the drawing. Sets the value of the bound spaces property for the selected objects. Display objects that are set to bound spaces. Invokes the AutoCAD Architecture 2009 welcome screen. Closes the modeless layer manager. Invokes a modeless version of the layer manager. Note that only a subset of the layer manager's functionality is available in this palette. Exports building information to gbXML format.